Visualization can produce significant insights when applied to quantitative data. It is currently undergoing a renaissance that mirrors other developments in computing and data science. Sophisticated open source libraries such as d3.js or matplotlib, to name but a couple, are enabling an ever wider range of users to distill valuable information from the avalanche of data being produced. How could we represent economic activities visually? For example what fraction of GDP is related to each type? One solution is to adopt the used of pictograms. We have developed a catalog of 21 pictograms that correspond to the highest level classifications (21 in total), coded also by letters A through U in NACE Rev. 2. 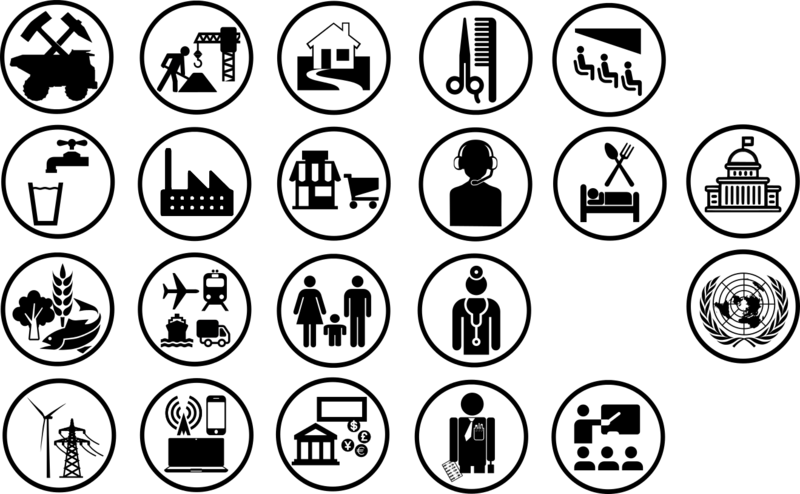 Each activity is represented by a two pictograms that differ only in the shape of their perimeter (square or circular). The collection is released under a Creative Commons Commercial, Attribution, Share-alike license. It is available for download and use in the usual place. Let us know of any good usage examples or suggestions and watch this space for examples using the collection for credit portfolio management applications!